K. Rool's Keep is the sixth world of Donkey Kong Country 2: Diddy's Kong Quest and the fifth of Donkey Kong Land 2. It is a perched castle situated on the very top of Crocodile Isle. As its name suggests, K. Rool's Keep belongs to Kaptain K. Rool. Since the area is at a high elevation, some surrounding areas are entirely frozen and constantly battered by high winds. The castle is hazardous to climb, as there are two ice caverns, a mine shaft, and three dungeons between the bottom and top of the castle. 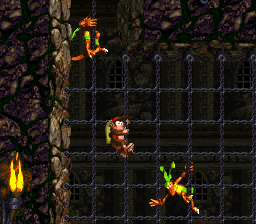 Every dungeon-based level has a quirk to impede Diddy and Dixie Kong's progress; The first dungeon has a rising floor, meaning the heroes could get crushed if they do not move out of the way of the ceiling quick enough. The only way to proceed up the second dungeon is by climbing chain links, guarded by a plethora of enemies and obstacles. The third dungeon has a rising pool of toxic waste. Donkey Kong Island also appears in the background, on the left side of the world map. Unlike the other worlds in the Super Nintendo version, K. Rool's Keep does not have a boss. However, it eventually received its own boss in the Game Boy Advance remake: a large, orange monster named Kerozene. 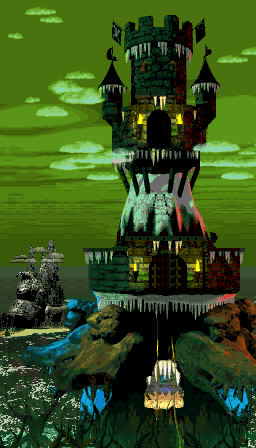 In the Game Boy Advance remake of Donkey Kong Country 2, the castle was remodeled to look like a cylindrical medieval tower, in addition to giving the bottom of the castle a floor of ice. Furthermore, there is snow outside at the world's Kong Kollege. Donkey Kong Island can no longer be seen from the world map. 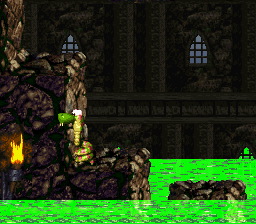 In the ending of both Donkey Kong Country 2 and Donkey Kong Land 2, after the Lost World explodes, the entire Crocodile Isle sinks into the ocean, including K. Rool's Keep. 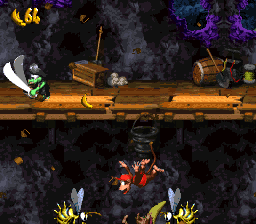 Castle Crush is absent from Donkey Kong Land 2 and is replaced with a different level, Dungeon Danger. In the Game Boy Advance release, the level order is slightly different: Castle Crush is the second level, Clapper's Cavern is the third, and Windy Well is the fourth. Arctic Abyss Arctic Abyss is a generic water level, featuring two appearances of Enguarde the Swordfish. 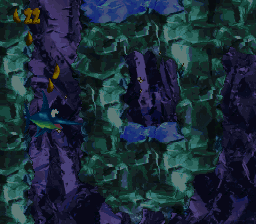 The water levels never change, unlike its namesake level, so the player may proceed at their own pace. Windy Well Windy Well is fundamentally unaltered from its Donkey Kong Country 2: Diddy's Kong Quest iteration. The player will get to the top of a mine shaft by being lifted by a strong gust. 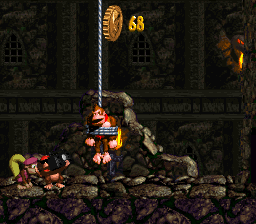 Collectible items, including Bananas and Banana Coins, can be acquired along the way. Dungeon Danger This level is a regular castle level with no rising floors, and replaces Castle Crush in Donkey Kong Land 2. It is a maze-like level. Clapper's Cavern Clapper's Cavern in Donkey Kong Land 2 is essentially the same as its Donkey Kong Country 2: Diddy's Kong Quest predecessor: Clapper must be used to get across pools of water, but instead of the waters having Snapjaw, instead the water itself is harmful to touch. Thus, if the water thaws out before the player can jump to land, they will be injured. The unfrozen water is darkened similar to lava seen in Krem Cauldron, but is extremely cold instead of extremely hot, still being unsafe to swim in. Chain Link Chamber Chain Link Chamber has the player climbing up the castle via chain links, and they can find some bonus items along the way. The level itself has a straightforward route without much room for deviation. Toxic Tower Toxic Tower has the player racing against rising toxic waste. 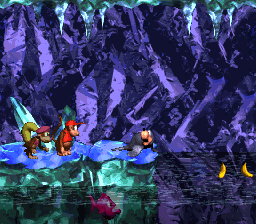 Similar to its namesake level in Donkey Kong Country 2: Diddy's Kong Quest, three animal buddies are used, but the order was altered. After a brief chain link climbing segment, Squitter the Spider is used first, then Rattly the Rattlesnake, and finally Squawks the Parrot. 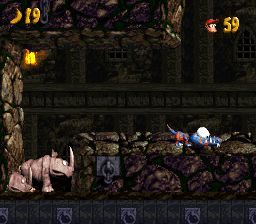 The first two Animal Buddies take up the beginning of the stage, and Squawks is used for the remainder of the level. Stronghold Showdown Stronghold Showdown has the same purpose as it did in Donkey Kong Country 2: Diddy's Kong Quest. Sanchō no Toride "Kurokoburugu" Mountaintop Fortress "Croc-berg"
This page was last edited on April 16, 2019, at 21:30.